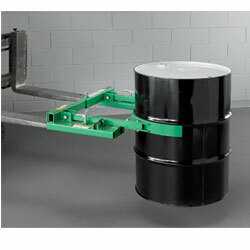 One person can pick up, transport, and unload empty or full drums up to 1,500 lbs. Spring-and-cam actuated jaws use drum weight to maintain a constant grip until drum is set down. 6" x 15" jaws adjust manually to handle any drum from 1828" in diameter. Grips steel 30-, 55- or 85-gallon overpack drums. Jaws are lined with bonded rubber to prevent marring. Fork-mounted unit easily attaches to a lift truck in seconds. 34"L x 33"W overall. 18-1/2" between fork tubes; 19-1/2" between forks. Safety chain included. IN STOCK.